While the springs are responsible for counterbalancing the garage door, the tracks help keep it in place while it's moving. They guide the rollers during the opening and closing of the door. This is one of the reasons why problems with these components are usually easy to spot. With proper care, the risk of issues will be minimal. The first rule of maintenance is not to do anything before you examined the component closely. The check-up can reveal serious issues which will need to be quickly addressed. It is fairly easy to examine the tracks. Start from as low as the bottom seal and work your way up. There are three things, in particular, you need to watch out for. A blockage may not seem like a big deal, but it can create a major problem if it’s not removed in time. Track misalignment is another common problem which shouldn’t be ignored. If the two sections do not connect perfectly, the whole door can start to malfunction at one point, and may get off track. Red flag number three is bending. If you happen to notice any bent sections, timely repairs are required. Otherwise, the track can break and will need to be replaced. 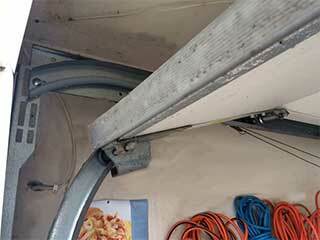 Our experts at Garage Door Repair Trumbull will be happy to assist you with these complex problems. A blockage can be easy to deal with. Pieces of gravel can be removed by hand (just be careful not to get hurt by the rollers). You may want to use a brush or another non-abrasive tool to get rid of stubborn dirt. Before you begin the work, however, you should remember to disconnect the opener for safety reasons. Sticky and hardened dirt can be easily removed with brake cleaner. You just need to spray it on the affected areas. Generally, it pays off to clean the entire track to make the lubrication of the rollers easier and more effective. A mild solvent can also do the trick. You just have to confirm that it is safe for galvanized steel which the door’s hardware is often made from. It pays off to check all the bolts and brackets before aligning the track sections. In general, this problem is usually the result of loose brackets. You need to watch out for all kinds of damage. If there are broken or missing bolts, you need to replace them as soon as possible. Otherwise, the sections will get misaligned again. When you adjust the sections to match each other, you have to tighten all the bolts so that the brackets can stay firmly in place. Despite what many people think, tracks do not require lubrication maintenance. Metal rollers do. If both get lubricated, the path of the rollers will be very slippery and this will cause serious problems with opening and closing the door. If you have rollers with nylon wheels, only their stems will need lubrication. The choice of product is always important. It must be light. It must not stick to the components and attract dust, dirt and insects. Also, it should not harden when the weather gets cold. This is extremely important for keeping the door working optimally during the winter. Generally speaking, silicone spray or white lithium grease can serve you well. Still it's best that you consult your owner's manual to find out which type of lubricant is right for your door. Our number one priority is the safety of our customers. We work hard to ensure that you can always rely on us to get the job done right, whether we’re replacing a broken spring or repairing a malfunctioning opener. Contact us today to arrange an appointment, or take a look at our website to see what services we offer. Thank you for choosing our company! Feel free to browse our website for more information in the meantime. Our team at Garage Door Repair Trumbull is at your service any time!